The students of McDaniel College Budapest ventured on their semester trip, this time to Sofia, Bulgaria. Eight students gathered together to travel to Bulgaria, a country that in more ways than one straddles the boundaries between the European west and Muslim middle-east. Although the flight was slightly delayed, students enjoyed themselves at Liszt Ferenc Airport playing foosball and doing some window shopping. As Bulgaria is outside of the Schengen Zone, paperwork was in order, and travelers were warned that customs officials were not very receptive to those of non-European origin. Sofia, the capital and largest city in Bulgaria, is in the Western part of the country. Surrounded by mountains, the city sits on the slopes of Mount Vitosha, which allow for pleasant views as one goes around the suburbs of the city. Sofia was named after Saint Sofia Basilica, a major symbol of the city. The basilica, which is one of the oldest in the capital, was used as the city’s main church during the middle ages and served as a mosque under Ottoman rule. After arriving at the airport and dealing with the unpleasant customs officers, we finally got to Sofia, wondering the experiences we were going to have and what the city had to offer. The atmosphere of the city was dense, slightly tinted by a light smog. A brief taxi ride took us to the hostel in the city centre where we would reside for the 3-day trip. Our hostel, Hostel Mostel, is housed in a two-hundred-year-old travelers inn that served as a government building for a few decades in the 20th century. Our apartment was separate from the main area of the hostel, but at least we had our privacy and comfort. The city has a sinister ambience at night due to poor street lighting. Sofia’s major sights are mostly churches, one of which is the famous Alexander Nevsky Cathedral. The cathedral sits on a hill and is located very close to the Saint Sofia basilica. 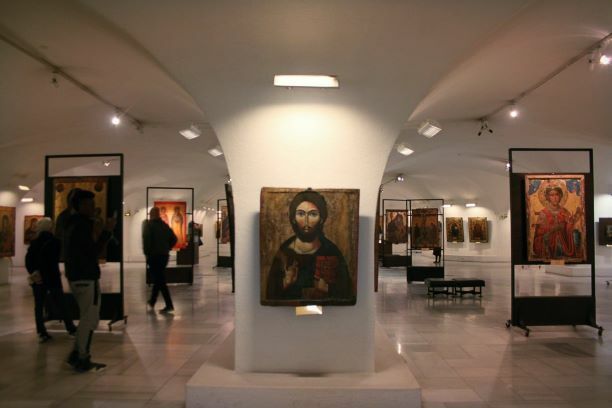 The crypt of the cathedral houses a large collection of orthodox Christian art and artifacts. The most remarkable experiences we had in Bulgaria were in the traditional restaurants. Almost every Bulgarian restaurant we visited had excellent food in decent portions. Bulgarian dishes usually involve some type of grilled meat or sausages. We found they had excellent vegetarian plates as well. Karnache, for example is a type of spiced sausage common on restaurant menus. Many dishes also have Arab and Eastern influence. Kebapche is a common dish made of pork and beef seasoned with cumin which gives it an eastern flavor. Kebapche plates are usually served with a garnish of French fries and grated cheese, pepper relish and some fresh salad. A good choice for those with a big appetite is the mixed grill plate which included various grilled beef and traditional sausages, with a side of potatoes, beans, salad and gravy. The platters were large enough that three guys could share one and still be full! 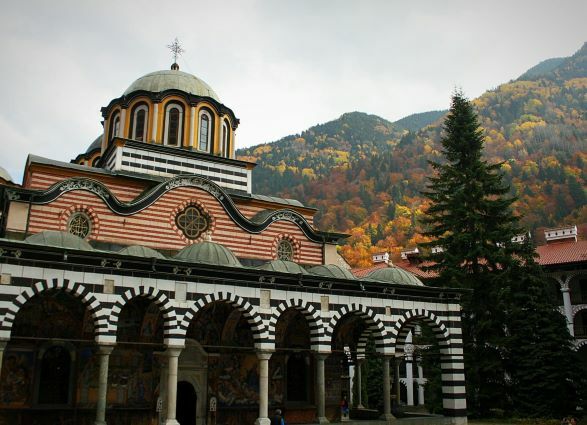 On the third day of our trip we visited the Rila monastery, which is a two-hour drive from Sofia. Rila was undoubtedly the most attractive sight of our visit in Bulgaria. The drive to the small town was accompanied by a scenic view of Bulgaria’s mountains. Upon arrival, we went on a hike with a barefoot guide of one of the mountains at Rila where the history of the hermitage and monastery begins. Rila Monastery, which is a UNESCO world heritage site, is considered a symbol of the 19th Century Bulgarian Renaissance. The monastery is named after St. Ivan Rilski, who was a famous Bulgarian hermit. St. Ivan is said to have spent seven years in his hermitage, learning the healing arts of plants and the cycles of animals around him. After the hike, we had the thrilling experience of climbing through St. Ivan’s hermitage, which had been decorated with candles brought by believers and admirers. According to legend, St. Ivan performed numerous miracles during his years of isolation in order to help his people. As he became more popular, he had several young followers who started settling around his cave with hopes of getting blessed and learning from his ways of worship. This subsequently led to the building of the symbolic monastery by his students. The tour through the hermitage ended with the group climbing through a small hole in its roof; folk lore says that those who enter the cave and clibm through the roof are cleansed of their sins (note to self: return yearly, just in case). A short drive took us back to the monastery, a stunning work of art that we passed on the way to the hermitage. The monastery is decorated inside with frescoes on the walls and gold-plated iconography. The facade of the religious edifice has striped, painted arches and five domes on top. The chambers around the main monastery currently houses around 600 monks. The view of the spiritual retreat was complemented by the surrounding mountains, which were covered with autumn leaves. Chirping birds among the quiet tourists gave the place a very tranquil atmosphere. Photo taken by Sarah Diefallah. Although McDaniel students were glad to return to Budapest, the trip to Bulgaria was an interesting experience that gave each participant a different perspective on European culture. In summary, Sofia itself wasn’t the best place to visit, but the company made a difference.